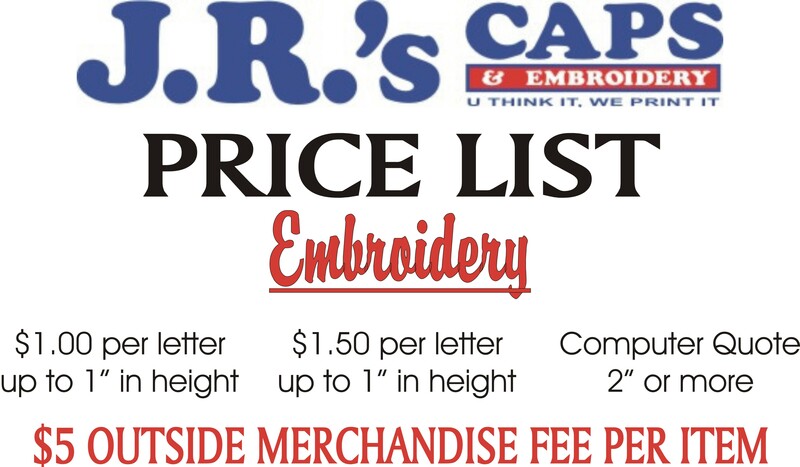 What do you charge for embroidery? Are you able to embroider a custom design? Can I bring in my own merchandise? There is a $5 outside fee per item when bringing in your own merchandise. ALL ITEMS MUST BE BRAND NEW OR CLEAN!!!! There is no minimum for orders. Group pricing is available for 12 or more items. We ask that you give us 1 week to a week and a half to complete your order. Pricing is based on stitch count (for embroidery) or ink usage (for garment printing). Everything we do is on a first come first serve basis. We try to finish individual orders within the same day.